Director of football Barry Fry (left) and chairman Darragh MacAnthony (right) led the negotiations for Posh on transfer deadline day. There was a frustrating end to transfer deadline day (January 31) for Peterborough United. Posh completed business at 11.30am and 8pm by signing club legend Craig Mackail-Smith on loan from Luton Town until the end of the season and securing the services of highly-rated midfielder Port Vale Anthony Grant on a two-and-a-half year contract. Anthony Grant (left), in his Crewe days, challenges Posh star Marcus Maddison. Manager Grant McCann will be pleased none of his first-team squad were sold, but he would have shared chairman Darragh MacAnthony’s frustration at a last-hour failure to sign a strong young striker from a Premier League club. MacAnthony wasn’t happy with the player’s club after they pulled the plug on a loan deal at 10pm last night to scupper a season-long pursuit. “I’m done signing young players from the Premier League until the Football League sort out proper new rules on it all,” MacAnthony moaned. “It’s awful the way it is right now. “We had agreed a loan deal for long-term target with a Premier League club. The paperwork was being completed, but his club pulled the plu one hour before deadline which typifies many Premier League clubs’ attitude towards the lower leagues. Craig Mackail-Smith playing for Posh in 2011. 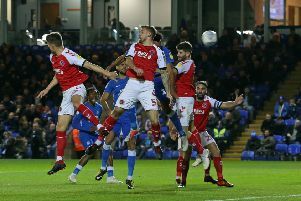 MacAnthony also revealed that the Posh squad had been told on Saturday night (January 28), following a dismal 4-0 home defeat at the hands of MK Dons, that none of them would be sold in this transfer window. That pleased McCann who is happy to try and re-energise a faltering promotion push with just the two additions to a squad that had been good enough to reach the top six before Christmas. McCann said: “Signing Craig again was a no-brainer and I have played against Anthony so I know what a handful he can be. “I felt the squad needed some experience so I have addressed that. Craig will be a massive help to our younger strikers and he is a lot fitter than the last time he was here (Mackail-Smith played three games on loan at the club in 2014). He has a point to prove and I’m looking forward to seeing him in a Posh shirt again. “Anthony is a leader on and off the field. He is a good enough player to dictate games. Grant’s arrival softens the blow of losing defensive midfield hardman Michael Bostwick who faces a month on the sidelines after sustaining a broken jaw in the Mk Dons match. Grant can play in Saturday’s (February 4) League One clash with Vale at Vale Park. Seventeen League One clubs signed 33 players between them yesterday.